*Disclosure: Product was provided at not cost. This in no way affects the feature as all opinions are of my own. Dove - the brand trusted around the world for its skin care and moisturizing expertise introduces New Baby Dove, its first ever range of baby care products. I love Dove and have used it on myself for years, so I am super excited it's finally expanded it's line to baby care. Baby Dove is a range of baby care products born from the Dove brand's 60 years of skin cleansing heritage. Baby Dove products go beyond mildness to replenish essential moisture and nutrients in baby's skin. With two product ranges, Rich Moisture and Sensitive Moisture, the product portfolio is appropriate for all skin skin types. When I think baby, I think of gently, precious, soft, silk like skin and Dove is the perfect match. I used this on my grandson and it helped to keep his smooth fresh and silky all day! The hair care products are hypoallergenic and tear free as well. Giveaway! Dove Baby will provide one of our readers with a few of their newest products. Shipment will be provided by the brand. Must be a US resident to enter with a physical mailing address. 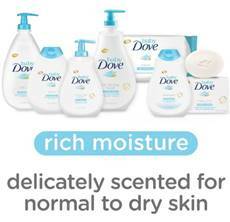 Tell us what you absolutely love about Dove! Giveaway closes 07/21/17 at 10pm pst.